Tyus Jones, barely removed from Apple Valley High, started at point guard tonight versus Russ Westbrook. How a person feels about tonight’s preseason game against the Oklahoma City Thunder depends largely on what that person expected, going into the game, and why they held those expectations. Ricky Rubio has been held out of action for the past few days and we knew that he would not play tonight. (His ailments are not expected to be serious or threaten his regular-season availability.) 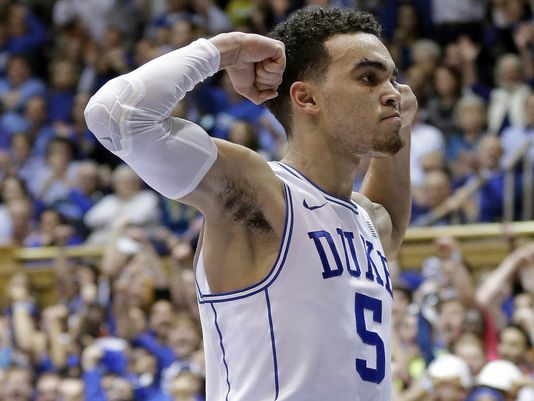 Add to that the announcement that 19-year old, was-attending-Apple Valley-High-School-17-months-ago Tyus Jones would replace Rubio in the starting lineup against Russell Westbrook, and nobody could reasonably expect a successful outcome. Along with the Jones/Rubio lineup swap, Sam Mitchell made a surprising proclamation yesterday: Zach LaVine will be this team’s starting shooting guard; not Kevin Martin, who was named the starter by… well, himself, at Media Day. This announcement was Mitchell putting bold, italized, capitalized type on that DEVELOPMENT word that he has been throwing around ever since taking over coaching duties. LaVine as a Day 1 starter sends a clear message that potential, and future take priority over actualized ability and the present. So with all of that built into people’s respective Game Previews, a 23-point loss to the full-strength (well, aside from Steven Adams) Thunder was not surprising. The Wolves starting lineup featured two one-and-done rookies, and two one-and-done sophomores. None of these four are old enough to legally enter a bar in Downtown Minneapolis and yet there they were, all four of em trying to guard Westbrook, Durant, and Ibaka. Defense was the big, obvious problem tonight. Aside from when Kevin Garnett was on the floor (all of 7 minutes 52 seconds) and when Westbrook and Durant were on the bench (they were both game-high +22’s) the Wolves simply could not get stops. Westbrook was coming off of high ball screens and flooring the accelerator straight down the middle of the lane. Help usually came, but the defense was so out of sorts that Russ was able to do something good with the ball almost every time. He had 14 points and 13 assists on the night, and was every bit as insane out there as he would be in a Finals game. When the Thunder were not rolling behind Westbrook penetration (or transition sequences) they were running Durant off of Enes Kanter down screens, setting up equally unstoppable action on the wing. Durant, against this defense anyway, makes this a pick-your-poison proposition if there ever was one. Too much help led to nifty passes slipped to Kanter for an easy two points. Not enough help meant, well, Durant would score it himself. In my opinion, the Westbrook stuff was more preventable (by a hypothetical, good defensive team) than what Durant was doing on the wing. I think Ricky Rubio would do a much better job than Jones and Lorenzo Brown did of jumping out, forcing Russ different directions from where he wanted to go, and at least making him do something besides those halfback dives to the rim. In any case, the defense struggled. They gave up 122 points on 56 percent field goal shooting. It’s hard to say anything but bad stuff about that. It looked like last year, with the caveat that they (for 22 of the 48 minutes, when Russ & KD played) were facing elite competition. As you already know, the draft was last Thursday, and it was a big one for our favorite team. I decided to take it in over at the new Mayo Clinic facilities, and swing through the arena for the announcement of the first pick. What follows is some parts recap of that night, with some thoughts about the Wolves two draft picks and where the team finds itself right now, heading into Summer 2015. The Wolves first draft selection was equal parts boring and exciting. For at least a few days, the media had been reporting that Flip was going to draft Karl-Anthony Towns from Kentucky. Brian Windhorst went on ESPN — live, from Minneapolis — shortly before the pick was officially announced by Adam Silver, to confirm that this was still the case. So there was not the unpredictability that has come to define Timberwolves drafts of the past decade. 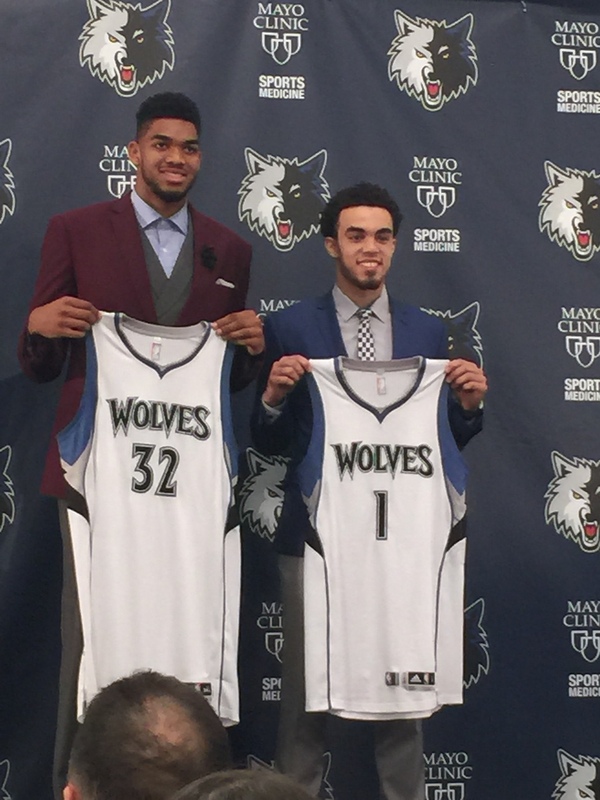 As expected, the Wolves chose Towns. Perhaps that was a good thing this time around, because in taking Towns the Wolves set the Target Center crowd on fire with cheers. Its team had just taken the consensus “best player in the draft,” for the first time in franchise history. In his conference call with Minnesota media on Thursday night, and especially at his introductory press conference the next day in Minneapolis, Towns said all the right things. He compared joining the emerging nucleus of young Timberwolves talent to playing for Kentucky. He looks forward to being mentored by Kevin Garnett, because he wants to learn what it takes to become a champion. He looks forward to taking care of his parents, who sacrificed so much for him to reach this point. He is emphasizing “playoffs” as a goal for this team. Like, right away. Whether unrealistic or not, that’s a refreshing thing to hear said, after a season spent losing on purpose. The psychoanalysis that we all perform on these 20-year olds is unfair for a number of reasons; perhaps most of all because of the unusual venue in which we observe them. But we do it nonetheless. Andrew Wiggins is a man of few words. He’d rather let his actions on the court speak for themselves. Zach LaVine has a well-intentioned cockiness about him. When most of the new, young Wolves looked nervous on Media Day last year — usually sharing the press conference table with a teammate — the 19-year old, looked-more-like-15-year-old, LaVine sat by himself and began his own presser with a, “Sup wit y’all?” to the media before him. Towns is thoughtful and gregarious. He enjoys speaking to an audience, but carefully considers a question before answering it. In the past year, he has listed Len Bias as his favorite player, and shouted out Felipe Lopez as a fellow Dominican baller. For a 19-year old, he’s showing off impressive knowledge of basketball esoterica. Whether any of this matters once he steps on the court is a fair question, but for now the personality is all we’ve had a chance to see, and Karl-Anthony Towns “won” his press conference. Assuming he can play like most expect, Towns is going to be a fan favorite.